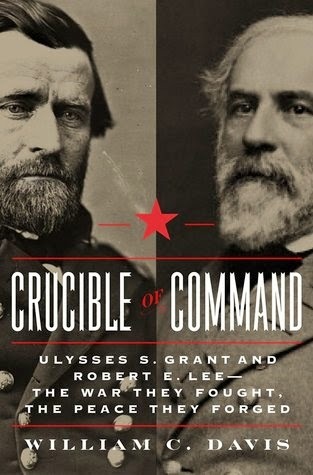 Veteran journalist and author Joseph C. Goulden offers a good review in the Washington Times of William C. Davis' Crucible of Command: Ulysses S. Grant and Robert E. Lee - The War They Fought, The Peace They Forged. For serious historians of the Civil War, William C. Davis is the ultimate go-to source for reliable information on a conflict that spawned a staggering amount of mythology. He is the author of more than 50 books on the war and the South, and until recently was director of the Virginia Center for Civil War History at Virginia Tech. At hand is a thick — and very readable — volume that culminates a life of serious research into all aspects of the war, including personalities, strategies and politics. Mr. Davis, fortunately for all of us, is a stickler for original and contemporaneous sources, rather than long-after-the-fact memoirs. And, indeed, the chapter notes (112 pages of them) should be read along with the text. An example: The popular depiction in “history” of Gen. Ulysses Grant as a drunk? After studious research, Mr. Davis concludes, “This is all based on a considerable array of mythology, and virtually no contemporary evidence.” Previous biographers relied on 60-year-old “recollections.” One so-called source was an officer who was “dismissed from the service in 1863 for disloyalty,” and vainly pleaded with Grant for reinstatement. Mr. Davis also demolishes a sensational story in the Union press that Gen. Robert E. Lee personally horsewhipped a runaway slave woman. We expect no less of a Davis (ha). I've not yet read the book, but I will based on my friend Joe Goulden's review. I too am very interested in the Civil War and I've read a good many books on the war and the times. I once had a conversation with a man who leaned left and he told me that we were living in the "most contentious time in American history." I replied, really? More contentious than the Civil War? More contentious than the War of Independence and the Cold War? As a student of history yourself I'm sure you realize that we live in a far better age than any in the past, despite all of our troubles. Our times just seems to be the worst because, a: we are living throught it, and B: communication outlets are so good and fast, with 24-hour cable news and the Internet. Our free nation will endure long after we are in Heaven watching the new American dramas unfold on earth as if we were watching a TV mini-series. I know that I sometimes sound like a nattering nabob of negativity (and I thank Spiro Agnew for that phrase), but I do worry that either a constitutional or infrastructure crisis is on the horizon that will threaten all of American culture, society, and values as we know them now; I am not bold enough to "predict" the form and scope of that crisis, but the past several decades suggest tougher times ahead. It will not be a civil war, but it will be most unpleasant. Consider, for example, Forstchen's novel, One Second After. But enough negativity from the Gulf coast's nattering nabob for one afternoon. Carry on, shipmate!